Tyson came to the pound in April 2006, with his son Monty. 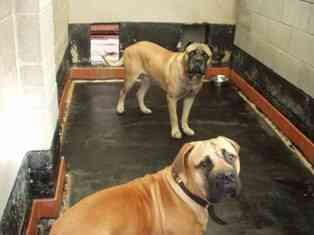 Both beautiful Mastiffs, they were sadly not claimed and rescues spaces were found. Rochdale Dog Rescue arranged to have both boys neutered before moving to rescue, and Amanda helped with this transport. When well enough they moved to boarding kennels chauffeured by Heather, while transport was arranged for later in the week. Whilst in boarding kennels Monty was offered a home, and although the Father and son team were clearly comfortable with each other, neither seemed to mind being apart. So the decision was made for Monty to go to his assessed home, and for Tyson to continue on to rescue. Tyson didn’t seem to miss Monty one bit, especially when a young female dog moved into the kennel next door. He was a terrible flirt! 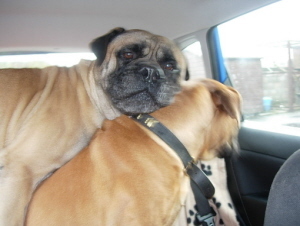 The day came for Tyson to move to a Mastiff rescue, and arrangements for his transport were made. Helped by Emma, Lindsey and Barry, Tyson travelled a long way, but by tea-time was happily settled in his new rescue kennels and enjoying his meal. As the rescue’s Secretary Barry maintained a close watch on Tyson, and a bond formed. As Tyson was only around 5 years old he had plenty of energy and loved his walks and play-times. In early May we had a call with some very sad news. Tyson had become unwell and tests had shown that he had an inoperable and very aggressive Lymphoma Sarcoma…Tyson would be dead within the week. It was sad news for everyone that had met him; he was such a lovely boy with not a bad bone in his body. He just wanted love, fuss and security. Barry spent Tyson’s last few days with him, and when the time came a good breakfast was followed by a long walk. On their return Tyson was cradled in Barry’s arms as he drifted to sleep forever. Everyone who met or had dealings with Tyson felt very honoured to have known him, and his passing is felt by many. He was a gentle giant, and although he never made it to a new home, he died in the arms of someone who cared very much for him, surrounded by love. May he always be remembered for the big softie he was.